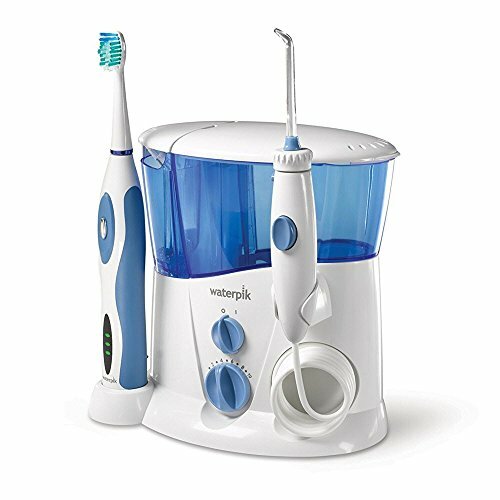 If you are someone looking to improve their oral health and are patiently waiting for a great deal before you take the plunge, then you can’t go wrong with the Waterpik Complete Care WP-900. It is two products in one – an electric toothbrush and a water flosser. Individually, both products can do a great job cleaning your teeth. Together, they will change your dental life. If you were to compare the WP-900 to individual products like the Waterpik Sensonic Professional Plus electric toothbrush (SR-3000) and the Waterpik Ultra water flosser, you’ll find that their combined retail price is around $150. On the other hand, the WP-900 is around $100 or less. In terms of value, it’s already clear which is the winner, and you don’t lose out on any of the advanced features these products offer, since the WP-900 has them too. Speaking of features, let’s go over what exactly is included in the box. The Waterpik WP-900 is decked out with loads of useful features that can up your dental game. Let’s go over all of them. Large water reservoir. With its 23oz (700ml) capacity, you can expect to use this device on the highest pressure setting for 90 seconds before needing a refill. 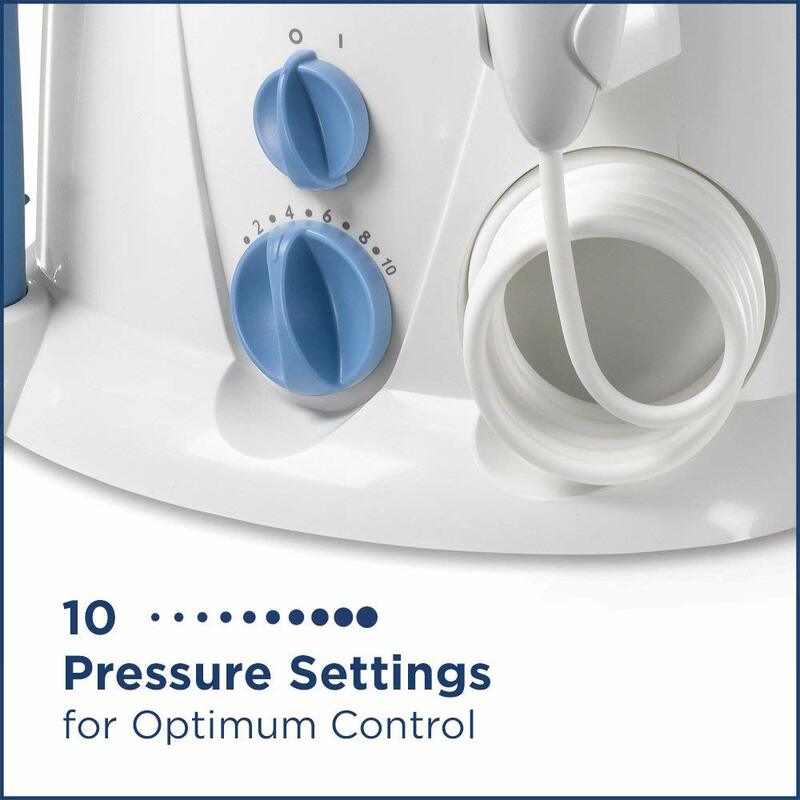 Ten pressure settings. Starting at 10 PSI (level 1) it increments 10 PSI each level all the way to a maximum of 100 PSI (level 10). Tip Holder. A convenient, lid-covered storage area that allows you to store all of your most used flosser tips. Sonic Toothbrush. Remember, this is two products in one. As part of a complete oral care package you need to have an electric toothbrush. It cleans thoroughly, has two different cleaning modes, and only needs to be charged once a week. 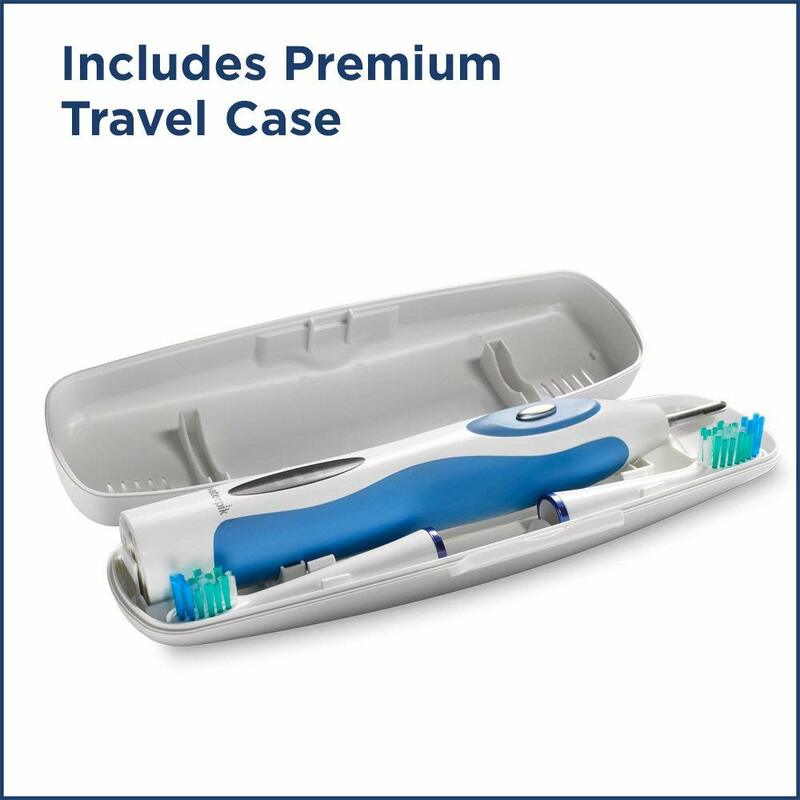 Premium Toothbrush Travel Case. You may not be able to bring your water flosser with you when you travel (unless you have a cordless water flosser), but at least you can bring the electric toothbrush with you in this durable travel case. Don’t let travel be an excuse for poor oral hygiene. Let’s talk about the water flosser first. The handle is wired to the base unit, which has a single power cable that powers both the flosser and charges the toothbrush. To floss, the unit must be plugged in at all times to operate; there is no built-in battery unlike the electric toothbrush. Both the toothbrush charger and flossing unit can be powered by a single power cable from the base of the WP-900, meaning you only need to use one outlet for two products. If you purchased a water flosser and electric toothbrush separately, then you’d need to use two outlets. The water reservoir and tip storage sit atop the unit. Approximately 2/3s of the space is reserved for the water reservoir. Capable of holding 700ml (23oz.) of water, you can expect at least 90 seconds of continuous use. The other 1/3 of the space, which is used for the tip storage, lets you put up to 5 flossing tips/toothbrush heads for easy access. Both the storage holder and water reservoir are covered with a lid that keeps dust and debris from getting inside. As for the controls, you can find them near the base at the center of the unit. There are two dials. The top one is the power switch, and at “0” the unit is off. Turning it to “1” will turn the flosser on. Below the power switch are the pressure settings. As mentioned earlier, at the lowest setting (1) the pressure is at 10 PSI, and at the maximum setting (10) the pressure is 100 PSI. If you’ve never used the product before or have sensitive gums, start at the lowest setting and slowly raise it by 1 level as you acclimate to the pressure. On the right side of the unit you will find the flosser handle, with its cable coiled neatly in a loop and has a maximum length of about 3 feet (90cm or almost 1m). This should be long enough for most people, unless you have an enormous washroom. You might notice a large blue button on the handle, and this is the flosser pause button. If you keep it pressed down, then no water will come out from the handle even if the flosser is turned on. Release it and water will freely flow again. Keep in mind the flosser tip can be rotated 360 degrees, giving you complete control of where you want to floss. The thin button located on the side just below the flosser tip is the eject button. Press it to release the lock on the tip and pull to remove or swap the tip. 2x Classic Jet Tips (JT-100E) – For general use. 1x Plaque Seeker Tip (PS-100E) – Allows you to brush and floss at the same time. 1x Orthodontic Tip (OD-100E) – Great for cleaning around braces or other orthodontic appliances. 1x Pik Pocket Tip (PP-100E) – Allows you to clean below the gum line, perfect for individuals that have periodontal pockets. If you are unsure of what to use, the Classic Jet Tip is probably the safest option. All things need replacing, and these flosser tips are no exception. The Classic Jet Tip can last 6 months, whereas the others should be replaced once every 3 months. 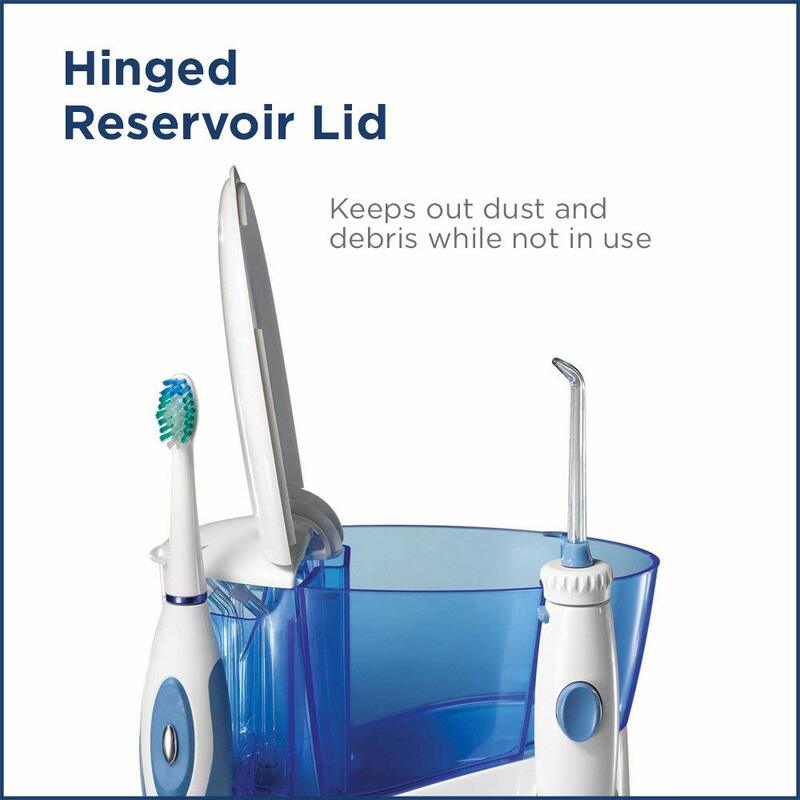 After you connect the desired tip to the handle and you’ve filled the reservoir with water, just turn the dial to 1 and you can start flossing. The first few times you will most likely cause quite a mess. Especially if your gums are sensitive, you may even experience some bleeding or irritation (even if you’ve set the pressure to a low value). As your gums adjust to the pressure, you can increase the pressure even more for additional cleaning power to remove stubborn plaque and food debris. It is recommended that you keep the flosser tip at a short distance (1-2cm) away from your teeth for it to be at its most effective. 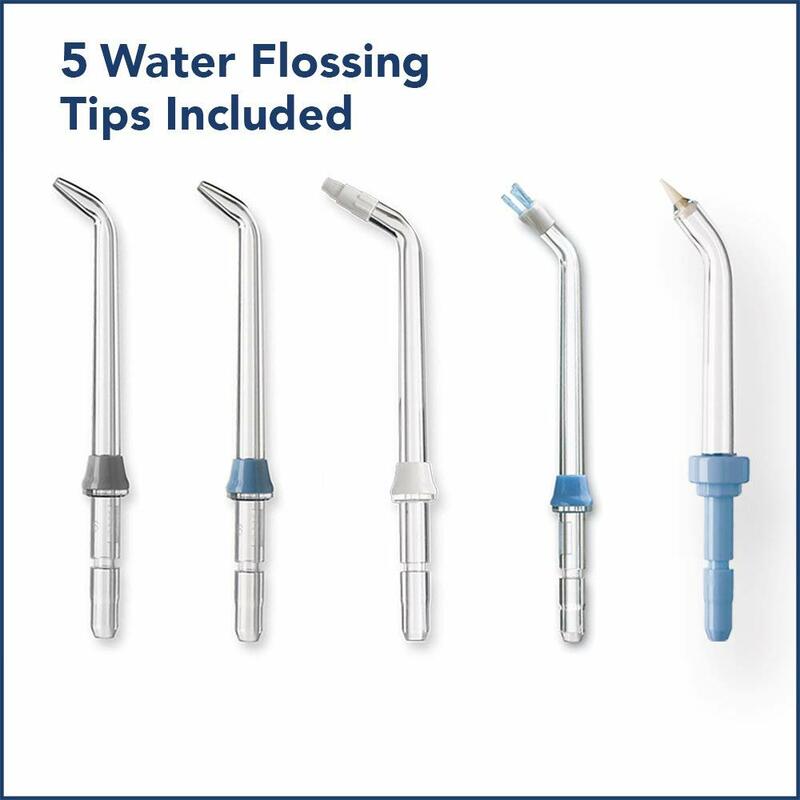 If the flosser tip is pressed up against your teeth, too much water pressure is concentrated on one area and other areas are not being cleaned to the same degree. The same idea applies to the electric toothbrush (which we will discuss below). If you press the brush head too hard against your teeth, the bristles will get squished, which means you are not cleaning your teeth as well as you could. So, don’t be too eager; just relax and let your appliances do the hard work for you, and you will get the best cleaning results this way. Please excuse the little tangent, let’s get back to our impressions of the water flosser. Since the WP-900 is capable of pumping water at up to 100 PSI, it inevitably needs to a noisy device. If you decide to use this water flosser in the dead of the night, anybody in nearby rooms will probably be able to hear it. One feature that is missing from the Waterpik Complete Care WP-900 is a timer/pacer to help you floss evenly by reminding you to not spend too long in one area and clean other quadrants of your mouth. Honestly, in other water flossers we felt that this feature was unnecessary, so its omission from this device is not a cause for concern. If appearances matter a lot to you, then the included electric toothbrush may be found wanting. However, appearances aside it works quite well and that is arguably the most important part. In the center you’ll find the power button located in the middle of an oval shaped rubber area that is designed to give you more grip. Below that you’ll find the battery indicator which lets you know how much juice is left in 33% increments (3 full greens is 100%, 1 green is 33%, etc.) It will light up for 10 seconds after picking it up from its charging base, and after you turn it off. If the 3 lights are flashing, it means the battery is drained and must be charged for at least an hour before use. Simply charge it with the included charging base, however DO NOT leave it there for too long. Doing so will continuously charge the battery (even if it is full) and reduce its life span. Once all 3 lights are green in the charge indicator, remove it from the charging station. This electric toothbrush is powered by a NiMH battery that can last for about a week before it needs to be recharged (this is assuming there is only 1 user, who uses it twice daily for approximately 2 minutes per session). The blue rubbery areas of the electric toothbrush provide grip and allows you to brush your teeth without worrying about rotating or dropping it. The electric toothbrush comes included with 2 different heads: standard and compact. As the name suggests, the compact head is just a smaller version of the standard head which is ideal for children, young adults, or for whoever prefers the smaller brush head. It is recommended to replace these brush heads once every 3 months, and you can purchase them in packs of 3 as needed. We’ve tested both out and they are equally effective at removing plaque and food debris, so choosing one over the other just depends on the user’s preference. The electric toothbrush has two cleaning modes. The first mode is slower, and therefore better for people with sensitive gums. Pressing the power button again switches to the second mode, which is much more powerful and delivers a punch to remove stubborn plaque. 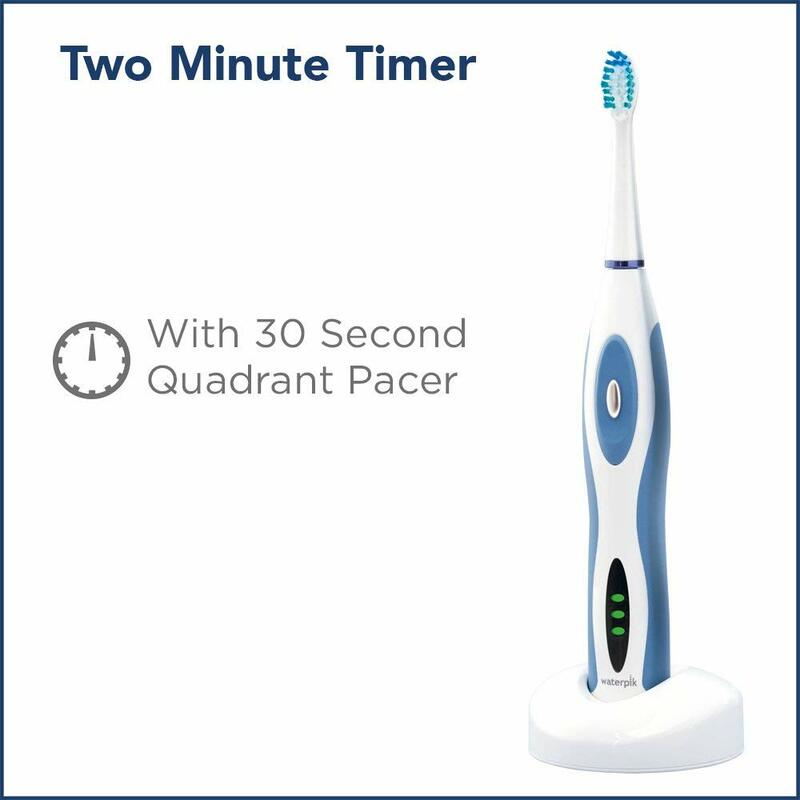 This brush is on a 2-minute timer, which is the ideal length for brushing that dentists recommend. Additionally, there is a pacer which activates every 30 seconds to remind you to move to another section of your mouth. Once 2 minutes is up, the brush will turn itself off. We were hoping for a pressure sensor that warns you if you are pressing too hard on your teeth, however not having one isn’t a deal breaker. In terms of overall cleaning power, this electric toothbrush did the trick and truly shines when used in conjunction with the water flosser for a “complete” cleaning, hence why this product is named the Complete Care. You can even take the brush with you since a durable travel case is included in the box. You can store the handle and up to 2 brush heads, keeping them safe for travels. Now you don’t have any excuses for having poor oral care while abroad! Interdental cleaning is an important part of your oral care regimen. Failing to clean the spaces between your teeth and gums will result in plaque buildup and bacteria growth that can lead to gum disease. By using the water flosser and electric toothbrush (along with their various flosser tips and brush heads), it is much easier to clean all areas of your teeth. Just a few seconds of water flossing can remove 99.9% of plaque biofilm. Waterpik’s Complete Care WP-900 offers quite a lot of value for its price. If you were to buy an equivalent water flosser (e.g. 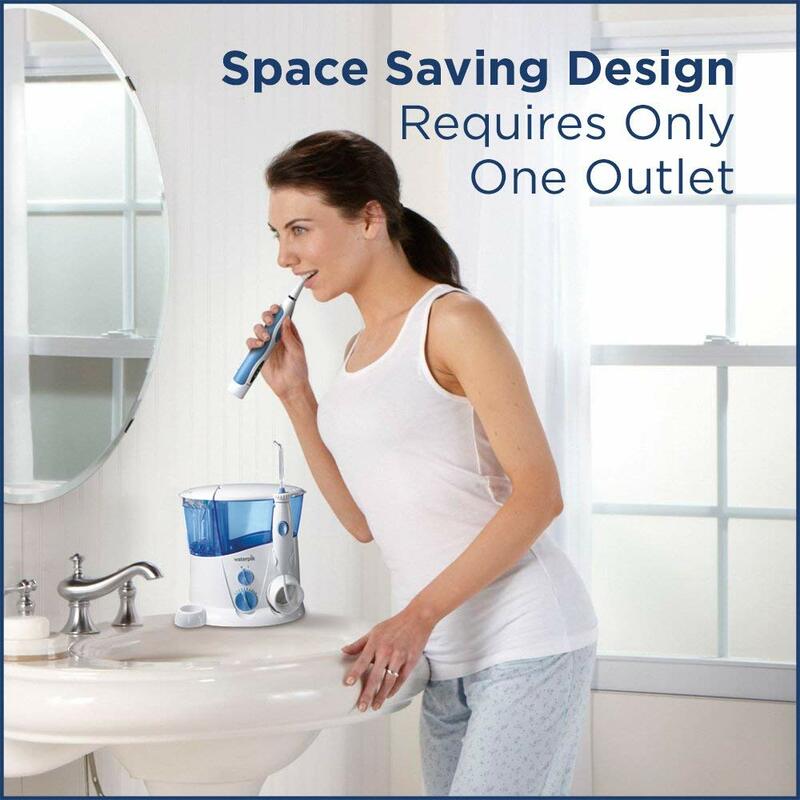 Waterpik Ultra Water Flosser, which retails at $60) and an equivalent electric toothbrush (say, the SR-3000 electric toothbrush which retails at $90), then you can get a savings of $50 with this two-in-one product.